Wave Expert Audio Editor Professional Audio Editing Software Wave Expert Audio Editor is designed to be a very easy and intuitive to use for audio editing. You will be able to open audio file and edit it,or record and edit it. It lets you make and edit music, voice and other audio recordings. Easy editing audio files lets you cut, copy and paste mix audio file, and it build in many sound effects. Wave Expert works as a wav editor or mp3 editor but it also supports a number of other file formats . Also it can convert most audio file to mp3,wave,ogg format. 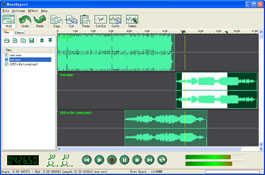 The powerful audio editer can recording any sounds from your pc , So you can Recording and edit audio file from Microphone,Recording and edit audio file from Videotape, Recording and edit audio file from WinAmp or Stream Audio from Internet Key Features: Sound editing functions include cut, copy, paste, delete, insert, silence, autotrim and more. Audio effects include, amplify, bass boost ,change speed and more. Supports a number of file formats including wav (multiple codecs), mp3, au, aif, flac, ogg and many more. Recorder supports , Recording and edit audio file from sound card . Unlimited track mixing lets you mix clips at once. Also supperts out as Mp3 Wave Ogg format . Easy to use interface will get you started editing in just minutes.